What is the steepest street in England? The reason I ask is because in my home town of Lewes in Sussex we have this street called Keere Street. somewhat pie-eyed George Regent drove a coach and four at breakneck speed after a night on the port down Keere Street for a bet. And won. Must have had good brakes in those days. Now, evn given mad and more than somwewhat tiddly heirs to the throne notwithstanding, I don't know of a steeper street in Britain. Is there an accredited Number 1 Absolute Steepest Street In The Whole Of Great Britain? And where does our little Keere Street in Lewes figure in the glorious charts? 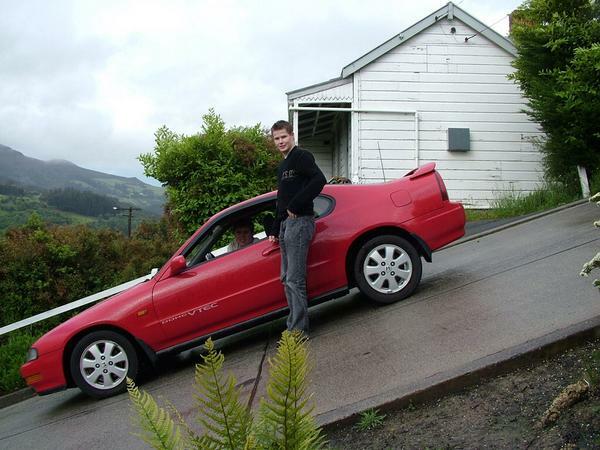 There are many claimants for the steepest street. Many towns are laid out around a church at the top of a hill so have steep hills leading up through the town. There is no definitive answer though because, as you found, the gradient is not measured unless the street is used by motor vehicles. The Guinness Record Book lists Baldwin street in Dunedin, New Zealand as the current world record holder of ’steepest street in the world’. This has since been disputed as it was originally listed as having a gradient of 38% but is still listed but with a gradient of 35%. The image below shows this street. I think the street in your town is unlikely to be 45 as this is a 100% slope and I think it would have to be steps to walk up or down (35% is about 20). Unfortunately, the Guinness book doesn’t list the steepest road in any other countries, including England. There have been several lists made of the “World’s steepest roads” but none of the top ten are in the UK. Generally, only streets that take motor vehicles are considered anyway. The steepest road in the UK is usually accepted to be Ffordd Penllech, a one way road (down only) near the centre of Harlech. This is a 34% gradient at its steepest point (on a hairpin bend in the middle) and it is marked 'unsuitable for motors'. However, there is no clear claimant for the title of ‘steepest street in England’ (Note there is a steepest road but I assume you want an urban street to rival your own). Chester's charming St Mary's Hill is reputedly the steepest cobbled street in England. I can’t find any information about the gradient though. Junction Street in Manchester is remarkable for being a steep inner city road. This is also cobbled and is about a 33% gradient. There's no lead in slope, you come off the level like going over the edge of a cliff, you can't see the road ahead until your bonnet drops down a few feet. It's only short though, about 75 yards. Old Wyche Road in Great Malvern, Worcestershire, is a very steep residential road, and some say one of the steepest in the country. This is no longer open to traffic. I certainly can vouch for it - I have never come across a steeper street anywhere. I had to take off my shoes to walk (almost slide!) down it and it nearly killed me climbing back up. Buit it was good fun. Once you've tackled Keere Street it is never to be forgotten! Strangely, harking back to Witz's detailed survey of other streets many of which appear to be cobbled, our notorious Keere Street is also cobbled. In fact, its ancient cobbles are quite unlike any I have seen elsewhere - or even on any other street in Lewes. They are not the usual squared-off granite sets but more like well chosen flints, probably from the sea judging by their smooth large-pebbly nature. They are more or less equal in size. They are also brown. Local yokels, struck by the strange appearance of these cobbles, call Keere Street rather aptly 'The Street of the Fossilised Kidneys'. Although most of the houses lining Keere Street are from the 1700's the street actually dates back to Saxon times. Originally built as humble artisans' dwellings, Keere Street (despite its Himalayan steepness) has become one of the most sought after addresses in Lewes...and one of the priciest. Why, I could never work out. You can probably imagine what it was like during the ice and snow of a few weeks ago! Mrs P-K and two neighbours and I had a hair-raising time slaloming down an icy Keere Street on our way to midnight mass on Christmas Eve. Not to be attempted by the faint-hearted. If you google Keere Street you'll find numerous pix of Keere Street but sadly none of them really show its steepness very well. Gold Hill in Shaftesbury is very steep. It's the one used in the old Hovis ads despite being in Dorset. Clovelly in Devon would be another contender. I have been to many places in and know there are some steep roads and street down Devon and Cornwall but The Steepest I have ever seen is here in Manchester ! There short clip on You Tube shows you. Just Google, Jutland Street Manchester. The appropriately named Steep Hill in the centre of Lincoln also deserves a mention. Some pretty (and) steep hills in the Cornish village of Fowey. There may well be (marginally) steeper streets in the UK but I bet they are either pedestrianised or have tarmac - nothing quite compares to going down these cobbles in freewheel! I'll buy that, Mr Curran. Your Jutland Street looks steeper than Keere Street in Lewes. I can see why you say people try out their handbrakes on it. And, there's that very handy block of flats across the end of Jutland Street to break their fall if the brakes are kaputt. That's good town planning at its best! Hardknott Pass apparently reaches 33%. However, the crown of "steepest signed street" goes to a road in Harlech which is signed at 40% due to the Highways Agency's policy of rounding. The actual value is something like 36%. Well sleuthed Siasl! I think that just HAS to be the steepest scariest driveable street in Britain. I found this 'living proof' photo of ffordd pen llech in Harlech but I couldn't find a translation for what ffordd pen llech in Harlech means in English. At least, Google Translate couldn't find a translation for ffordd pen llech. and I don't know any Welsh speakers dai bach. What does ffordd pen llech in Harlech mean in English? I think it is time the people were told! Any ideas? I have a vague memory of a photo of another street at Robin Hood's Bay which was steeper than the Main Street, but it fell into the sea. I do know that there are a lot of streets in Yorkshire which were left cobbled because it was said that if tarmaced they would be impassable in frosty weather. I'll admit that street in Robin Hood's Bay does look steep - but for my money Ffordd Pen Llech in Harlech just about nicks it. I'm still trying to figure out what Ffordd Pen Llech could possibly mean in English. Britain's Steepest Street?